Teen Mom 2 is back with a brand news season! Last night’s episode of Teen Mom 2 opens with Chelsea Houska who is seven months pregnant. She and her husband Cole DeBoer just bought a house on a large plot of land in a quiet rural area. The couple seems to be having many new beginnings, with a baby on the way and buying a new home. Everything isn’t as sweet for everyone on. Teen Mom 2. One cast member is fighting child abuse allegations the episode! Chelsea’s ex, Adam Lind, can now only see Aubrey at a visitation center. He has to show up fifteen minutes early so that they don’t run into one another. If he fails to arrive on time, the appointment is cancelled. While on the way to the visitation, Chelsea is very open and honest with her daughter about why she has to meet her father in this manner. Sadly, she receives a call from the center reporting that Adam didn’t show up and therefore the visit is cancelled. He will have to pay a no show fee in order for them to set up another appointment. My heart broke for Aubrey. It was apparent she was disappointed not to get to see her dad. Chelsea and Aubrey go for ice cream and discuss her dad not showing up. I was so sad to see her speak so matter of fact about knowing her dad makes bad decisions. She even said her step dad would never do that to her. I think it’s important to be honest with your children, but she seems abreast to a lot of adult conversations. I am just glad she has strong male figure in her life that she can depend on. Leah Messer’s daughter Ally is having issues with her health. She is using a new breathing machine to make her lungs stronger. Leah has a new older boyfriend, Jason Jordan. He has already fallen in love with her girls. Jason is a 39-year-old divorcee with a child. Leah let both of the kid’s fathers know about her new man. In a cute scene, Leah’s boyfriend gets tips for how to act on camera. One of her daughter confidently tells him “no farting on camera”. He seems to be good with children, so hopefully this one is a keeper. Jenelle Evans’ husband, David Eason is still not allowed to film after alleged homophobic tweets last year. Her ex, Nathan Griffith, recently refused to bring back her son Kaiser after finding bruises on him. Eventually, he had to release his son into her custody, but they go to mediation to reach a agreement. Jenelle meets with her mom, Barbara Evans to talk about the situation with Nathan. She reveals that he called the police and CPS to report possible abuse. Jenelle feels like he is trying to sabotage her husband and doesn’t understand because he does nothing wrong. Umm…. I could have sworn there is a litany of digital proof thanks to his social media that shows he does many things wrong. Barbara talks to one of the producers about finally getting along with Jenelle again. I really have struggled over the years witnessing how she talks and treats her mother. Barbara may not be perfect, but it is apparent she wants the best for her daughter and grandchildren. Nathan has a completely different story about the alleged abuse and withholding Kaiser. He claims his girlfriend alerted him to welts on his son’s bottom, after helping him in the bathroom. Nathan says his son named David, as the person who gave them to him. He doesn’t feel safe with David around his son, due to signs of abuse and his criminal record. Jenelle brings her husband to the mediation between her and Nathan. MTV cameras could not film outside as a result. They couldn’t reach an agreement during the mediation and a court date is being set. Jenelle meets up with her mom and the kids for ice cream and to talk about it. She fills her in on all of the accusations that Nathan made during the proceedings and her plans for court. This is really sad, no matter what the history is, the child’s safety should be the priority. Kailyn Lowry is raising three boys on her own at this point. She is possibly going to get back together with her youngest child’s father, Chris Lopez. She feels like he has been stepping up more recently with child support and visitation. While speaking to a producer she reveals that her ex-husband, Javi Marroquin is now living with his pregnant girlfriend, Lauren Comeau. 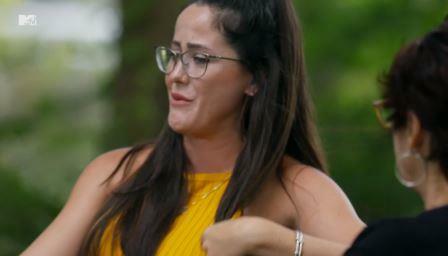 Kailyn doesn’t care for her because Javi was still tlaking to her when Kailyn was entertaining getting back together with him. Javi and his girlfriend, reminisce about them worrying about her meeting Lincoln meeting. Lauren is sad that she hasn’t gotten the chance to meet Kailyn yet. She wants her to be comfortable with her being around her son and for co-parenting to run smoothly. Lincoln has a soccer game and Kailyn wants to keep her distance from Javi’s new girlfriend. Unfortunately, she refuses to go unnoticed as she begins coaching and cheering from the sidelines. You can just see the smoke coming out of Kailyn’s ears as Lauren continues to try and be noticed. Needless to say she was unsuccessful. I personally think Javi should have arranged a meeting before forcing it at his son’s event and while filming Teen Mom 2. Briana DeJesus hasn’t talked to Javi since they broke up and she is perfectly fine with that. Her daughter, Nova’s father, Devoin Austin is currently living with her family. She is upset he isn’t spending enough time with his daughter. Briana tells her sister that she might kick out Devoin. She feels like his parenting is inconsistent and it’s a slap in the face because she is allowing him to stay with her. Briana’s sister thinks he just doesn’t know how to balance his new job and his duties as a father. Briana texts Devoin to let him know that he can’t stay with her anymore. Devoin is fine with it because he has his own place now. While hanging out with a friend, he talks about how awkward it was living with Briana. He appreciates her help, but he knows it’s time for him to move into a place of his own. I’m glad this ended early. Frankly, it was a recipe for disaster. Briana talks with a friend about the situation with Devoin while waiting on him to pick up her things. She debates whether she will actually allow her daughter to visit him at his new home. It’s definitely awkward with everyone watching him from the couch as he packs up his things in trash bags. I hope he will make time for his daughter in the future now that he doesn’t live with her anymore. TELL US – DID YOU ENJOY THE TEEN MOM 2 SEASON PREMIERE? DO YOU THINK JAVI SHOULD HAVE ALLOWED HIS GIRLFRIEND TO ATTEND LINCOLN’S GAME BEFORE MEETING KAILYN? DO YOU BELIEVE NATHAN’S CLAIMS AGAINST JENELLE AND DAVID? WHICH TEEN MOM 2 CAST MEMBER IS YOUR FAVORITE?